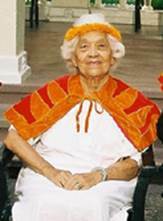 We have received word from Pelekikena Kaʻala Jay of Nā Wahine Hui ʻo Kamehameha I, Hawaiʻi Chapter 1 concerning funeral arrangements for Aunty Maria Artis. Wednesday, July 27, Diamond Head Memorial Park, 9:00 a.m. to 2:00 p.m. Burial will follow at 2:00 p.m.
Hale ʻo Nā Aliʻi will take charge, but Aunty Maria requested The Royal Order of Kamehameha and Nā Wahine Hui ʻo Kamehameha to be there also. She was our “Honorary Member” who honored us with her attendance at our meetings. Now it’s our turn to honor her. Aunty Maria Artis passed on July 8, 2016 at 6:16 pm. We will await word for her services and notify our members accordingly. Mahalo for relaying the information. This is a special request for pule for our most senior member of Hale O Nā Ali’i O Hawai’i. Auntie Maria was involved in a serious car accident last week in which she and her daughter were hit by an on-coming vehicle. Ikū Kau Naha (Past recording Secretary) Chris Rone Breezy, Auntie’s niece, called me to share that although Auntie initially did well, she took a turn for the worst on Sunday. Today the cardiologist shared that there was nothing more they would be able to do for our dear Kupuna. I ask you all for prayers; and that Ke Akua’s will shines through – His will be done. Auntie Maria’s 95th birthday is at the end of this month and she will be a recipient of the Kalani Ali’i Award in September, and would make 70 years in Hale O Nā Ali’i O Hawai’i on October 6th and 70 years in the ‘Ahahui Ka’ahumanu on the 7th of October. She is an Ikū Naha or Past president of the Honolulu chapter.